I lived on the Willem de Zwijgerlaan, Amsterdam-West and was 15 years old. We had the permission from our mother to go to the Dam, the Canadians were coming. I thought about it that it was possible that they would arrive at the Rokin so we looked for a good spot. We found it, above the kiosk, nearby the plantation. A few Canadians arrived at the Dam. We also saw some Germans arriving from the other side, but nothing happened. When the Canadians and the Germans has left, the shooting from the roof of the Groote Club started. Machine-guns, rifles, everything. The cause of the shooting, a banner with a pigs head on it, in front of the Groote Club. Panic! I said to my sister: ‘Jump, jump’. I laid flat on the ground, but my sister was gone. Next to me laid a man, about 40 years old. Suddenly he said to me: ’I’m leaving, it’s to dangerous’, I said to him: ’Stay on the ground, they kill you. Pretend if you’re dead’. He stood up and fell upon me, dead. I had to pull him off me. Eventually i left, looking for my sister. 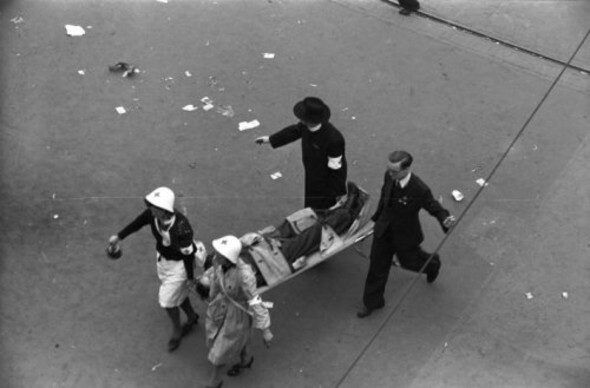 I looked behind me and saw so many people laying on the ground, chaos, everywhere prams……..
Photo: Wiel van der Randen, collection Spaarnestad / Nationaal Archief. What I have really admired were the men of the Domestic Armed Forces, but especially boys of my age, scouts, who helped people during the shooting. Should I’ve helped too? I had to look for my sister. I didn’t had the guts to go home because I lost my sister. Outside, via the IJ, I walked back to NIeuw-West, it took me hours to get home. When I arrived there my sister was already there; she ran away via the Vijgendam and was able to hide in a pub. I never told my story, not about the dead man in the Vijgenplantsoen, just to Jan van Straaten and you. Sometimes I can’t sleep at night. The last days of the war, it was terrible.